On the 1st Sunday of each month we have a special Children’s Mass where all children are involved throughout the celebration. Once a month we also celebrate the journey of the First Holy Communion children as they lead our reflection and worship. 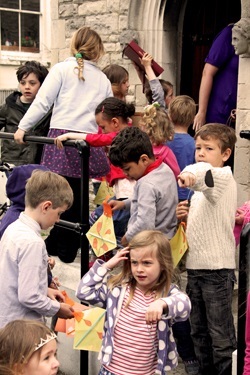 On the remaining Sundays we have Children’s Liturgy for young children old enough to attend unaccompanied by parents. Once a month a post First Communion children’s liturgy group also meet. We meet weekly at the coffee morning after the 9.30am Sunday Mass. All ages welcome. Come and join us for games, crafts, friendship, hot chocolate & biscuits. Feel free to bring your own game and someone to play it with you, or join in with one of our games. A space for young adults and students from across Brighton & Hove to journey deeper, explore life & faith, grow as disciples, build strong friendships, and get involved in mission. We meet every Thursday evening in term time in the Upper Room of St Joseph's Parish hall for food, a talk, prayer and a trip to our local pub! You're welcome to join us from 7pm, you'll find us at 6 Milton Road, Brighton, BN2 9TQ. For more info email LMsacredheart@gmail.com or join us on facebook: www.facebook.com/groups/deepwatersbrighton.